May 15, 2014 (Tony Cartalucci - ATN) - In the early hours of Thursday morning, M79 grenades and small arms fire were directed at anti-regime protesters camped out at Bangkok's Democracy Monument. The attack resulted in 3 deaths and over 20 injured - some of them critically. It was the latest in a string of terrorist attacks carried out by regime militants, openly organized and used by the regime to menace its growing list of political opponents. This premeditated conspiracy would manifest itself over the following days and weeks with a terrorist campaign unfolding evermore overtly and clearly by the hands of the regime's "red shirt" street front. By March, police arrested up to 10 regime supporters for firing 40mm M79 grenades at the National Anti-Corruption Commission (NACC) headquarters, which had been surrounded by regime supporters for days in an attempt to halt investigative proceedings against then Prime Minister Yingluck Shinawatra - sister and nepotist stand-in for convicted criminal, fugitive, accused mass murderer, billionaire Thaksin Shinawatra. Ten men have been arrested for firing M-79 grenades into the National Anti-Corruption Commission (NACC) office in Nonthaburi, while many war weapons were found hidden in an abandoned area near the agency's office. Police searched areas around the NACC after two M-79 grenades landed in its compound at around 10.45pm last night. The grenade damaged the window of a women’s restroom on the 4th floor of the building, while an exterior wall was damaged by another grenade. Many grenade fragments found scattered around the area. During the search operation, police found three men who behaved suspiciously, walking from a wooded area, an abandoned area in Nonthaburi Soi 46. Police also found a AK-47 assault rifle and ammunition. After that police detained seven more suspects who joined rally of the Radio Media for Democracy Group, the pro-government group protesting against the NACC, blocking the entrance of the agency’s ofices. Another group of police searched the bush near the stage of the Radio Media for Democracy Group and found hand grenades, a gun, bullets and an M-79 grenade launcher. A follow-up article would reveal that the hand grenades were RGD-5s - not only the same type used in other attacks against anti-regime protesters that have thus far left 24 dead, including men, women, and children, and hundreds more maimed, but were of the same lot number as well. Image: A 40mm M79 grenade launcher (with rounds) found by police near the office of the National Anti-Corruption Commission (NACC) in northern Bangkok. 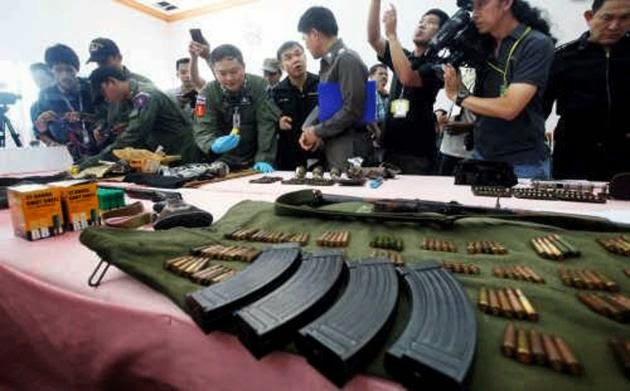 Several regime supporters were arrested in connection with the weapons which were used in several attacks on the NACC office as well as in other attacks across Bangkok and Thailand. Despite continuous and overwhelming evidence to the contrary, the Western media insists that it is "unclear" who is responsible for the coordinated nationwide terror campaign aimed at the regime's opponents. Red-shirt followers laid siege to Nonthaburi police station today (Friday) to demand police to release a group of suspects, including red-shirt guards, earlier arrested with a cache of war weapons in Chaeng Wattana area. 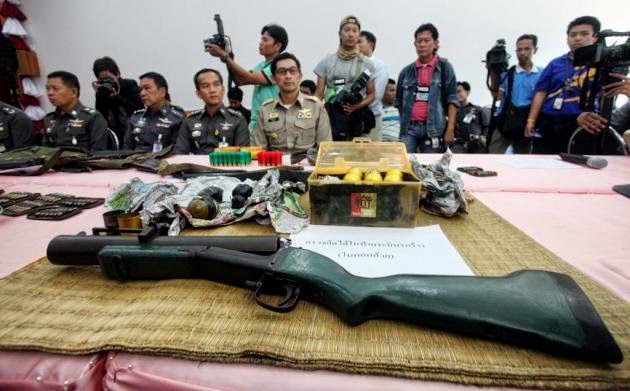 The suspects were arrested with several weapons, including one AK47 assault rifle, one M79 grenade launcher, several M79 grenades and hand grenades, one shotgun, a knife and several ammunition. There is no doubt that the regime has organized, armed, and deployed militants against growing unrest in the streets of Bangkok and indeed, in provinces around the country. A particularly brutal attack had been carried out against a rally in Trat province, several hours from Bangkok near the Cambodian border. One child was killed and scores more wounded when regime gunmen threw grenades and opened fire on more than 2,000 protesters. 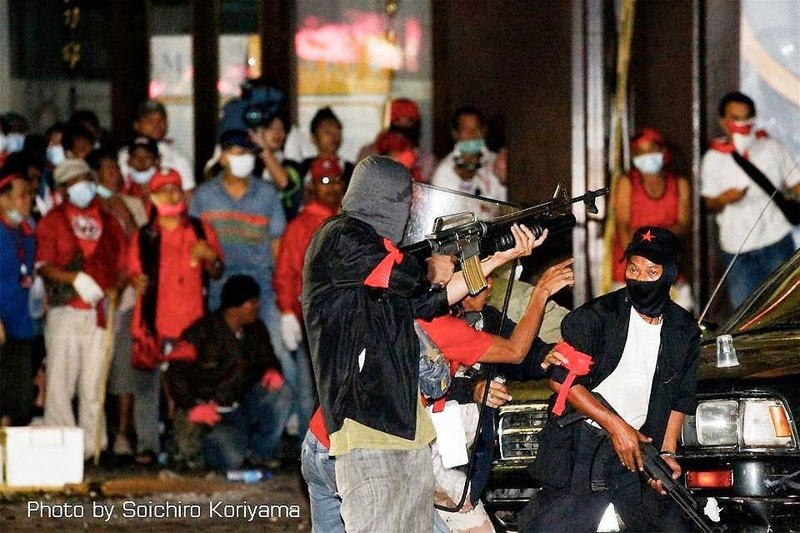 Image: Taken April 10, 2010, militants working amongst "red shirt" protesters would assassinate General Romklao and kill both soliders and bystanders in an attack that included AK47s, M16s, hand grenades and 40mm grenade launchers. Thaksin Shinawatra's "red shirts" were caught deploying up to 300 heavily armed mercenaries during April and May of 2010, wielding the same AK47s, M16s, and 40mm grenade launchers being used across Thailand today against Shinawatra's growing list of political enemies. "I have good news to tell my red-shirt brothers and sisters from all provinces. The People’s Democratic Reform Committee members of Suthep (Thaugsuban) at the protest stage in Khao Saming (Trat province) were deservedly given a reception by the locals. Five PDRC people were killed and over 30 injured. The locals welcomed them because they love Suthep a lot...,"
The Western media continuously defers to the excuse, "it was not immediately clear who was responsible," after each and every attack, no matter how many threats are issued before the attacks or how many celebrations occur afterward within the regime's political camp. The fact that only the regime itself possesses the resources to organize and arm militants with war weapons on such a nationwide scale makes it perfectly clear who is responsible. It must also be remembered that violence in 2010 carried out by the regime's leadership followed the exact same pattern and included the very same armaments and tactics of covert terrorism. While the Western media continues to portray the current political crisis in Thailand as one between "Bangkok's royalist elite" and the "rural poor" the protests now represent both Bangkok's business and middle class, as well as rural poor from across the country, including rice farmers that had once formed the foundation of the current regime's political support. This is owed to a disastrous rice subsidy program implemented by the regime in 2011, that has since gone bankrupt and plunged Thailand's once world renowned agricultural industry into crisis, leaving farmers unpaid, in debt, and increasingly desperate and angry. Additionally, the Western media consistently defers to the misconception that the current regime is "democratically elected," and that elections earlier this year were "blocked" by protesters before being thrown out by Thailand's courts, accused by the Western media of being "biased" and "politically motivated." In reality, even in provinces entirely devoid of protesters, February 2014's elections saw record low turnouts with over half of Thailand's eligible voters outright boycotting them, and with many that did vote electing to either deface their ballots or mark "no vote" in protest of both the regime and the democratic process it has hijacked and destroyed national confidence in. In the late 1990's, Thaksin Shinawatra was an adviser to notorious private equity firm, the Carlyle Group. He pledged to his foreign contacts that upon taking office, he would still serve as a "matchmaker" between the US equity fund and Thai businesses. It would represent the first of many compromising conflicts of interest that would undermine Thailand's sovereign under his rule. In 2001 Shinawatra privatized Thailand's resources and infrastructure including the nation's oil conglomerate PTT while raising the amount of shares foreigners could hold. This led to big-oil giants such as Chevron and Hess siphoning out billions in revenue from Thailand's natural gas and oil supplies. 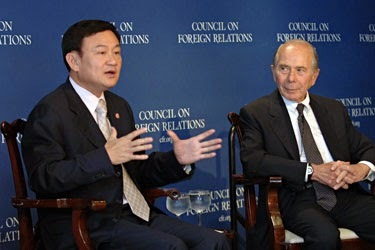 Also in 2004, Shinawatra attempted to ramrod through a US-Thailand Free-Trade Agreement (FTA) without parliamentary approval, backed by the US-ASEAN Business Council who just before the 2011 elections that saw Thaksin Shinawatra's sister Yingluck Shinawatra brought into power, hosted the leaders of Shinawatra’s "red shirt" "United Front for Democracy against Dictatorship" (UDD) in Washington DC. It is clear why the West continues defending the regime even as it descends into the craven depths of killing its own people through a campaign of systematic terrorism while threatening wider "civil war" if it is not allowed to remain in power. The BBC, AP, and others in the wake of the most recent terrorist attack, have attempted to spin the violence as the logical result of challenging what they still claim is a "popular government." In reality, the lies peddled by the West are much like the violence being carried out by the regime itself - intent on manipulating the crisis on a psychological rather than tactical or strategic level. If the growing opposition within Thailand refuses to blink, the violence and lies, however intense they become, will come and go.